COMMENT: Where now for UK aviation? Often seen as an easy alternative to Dubai for the western extremities of that city state, Abu Dhabi International Airport has completed the renovation of Terminal 1 including new duty free and food and beverage outlets. Terminal 1 is used by airlines except the national carrier Etihad whose home is the adjoining and nearly new Terminal 3. 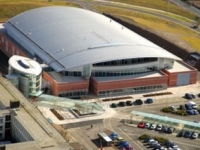 A few minutes from the main complex, Terminal 2 is for charter and budget carriers. The project included an increase in the number of check-in and immigration counters. 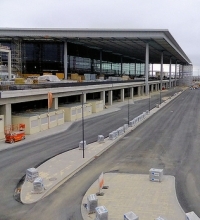 Carried out over 10 months it is part of a programme to expand the airport capacity and meet the anticipated traffic growth, whilst completing the longer-term expansion plans of the capital’s airport through building new terminals and facilities. With the order book now standing at more than 600 aircraft from eight airlines, Boeing has released details of 737 MAX programme, the plane having a 68-inch fan diameter for the optimized engine design. "The 737 is a more efficient, lighter design and requires less thrust than other airplanes in this class, which is important because weight and thrust have a significant effect on fuel efficiency and operating costs," said John Hamilton, 737 Chief Programme Engineer. "With airlines facing rising fuel costs and weight-based costs equating to nearly 30% of an airline's operating costs, this optimized 68-inch fan design will offer a smaller, lighter and more fuel-efficient engine to ensure we maintain the current advantage we have over the competition." The much rumoured Chinese airline into Gatwick is Air China. Chinese officials had been seen around the airport in recent weeks but were described as “inscrutable”. Which airline they belonged to was not available. 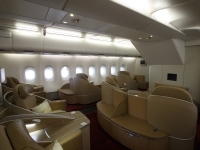 Beijing – Gatwick will begin during summer 2012 with a two-class Airbus A330 currently on Heathrow. The plan is to upgrade to a three-class Boeing 777-300ER. Speaking at World Travel Market (WTM) in London last week, Dr Zhihang Chi, Vice President and General Manager North America for Air China, said: “We fully intend to expand in the UK and increase our presence here but unfortunately we can’t do it at Heathrow. Our daily Beijing flight to Heathrow has load factors of over 90% – it’s ridiculously full. But adding capacity at Heathrow is out of the question and we have actually been agonising over this issue for a long time,” said Dr Chi. British Airways customers around the world will benefit from a new level of customer service thanks to thousands of iPads being issued to the airline’s senior cabin crew from next week. The move comes after a highly successful trial, involving 100 senior crew members, who are responsible for delivering service to customers onboard the airline’s 226 aircraft and reported by AERBT 22 August. Specially developed software and apps enable cabin crew to tap into data giving them customer preferences and their previous travel arrangements, allowing them to offer a uniquely personalised service. The three-month-long trial has been judged such a fly away success that British Airways has given the go-ahead for the specially equipped iPad 2 to be issued to 2,000 senior cabin crew across the entire British Airways long and short haul fleet. Manchester to Dubrovnik, Milan, Venice and Verona; Birmingham to Dubrovnik, Heraklion, Milan, Rome and Venice; Gatwick to Dubrovnik, Heraklion, Milan and Venice and Luton to Rome, are 14 new routes added to Monarch Airlines scheduled operation for summer 2012. Joining the airline are two further 174-seat Airbus A320s bringing the total up to five. The airline also operates 16 Airbus A321s in a 214-seat configuration, four Airbus A300-600Rs (352 seats), two A330s (374 seats), and three Boeing 757s (229 seats). An order for six Boeing 787 Dreamliners was recently cancelled, the airline saying it was due to delivery delays. Commenting on the expansion plans Managing Director of Monarch Airlines, Kevin George, said: “The strategy for Monarch Airlines is now firmly focused on its scheduled operations and we are delighted to be adding these new routes to our already extensive network of leisure destinations across Europe. Titan Airways, the Stansted-based VIP charter specialist, is bolstering its fleet with the introduction of two additional Boeing 757s, taking the total number in the fleet to three. Scheduled for delivery in spring 2012, the aircraft will be painted in Titan Airways distinctive livery with the interiors finished to a very high standard. It is anticipated they will be ready for service by May 2012. 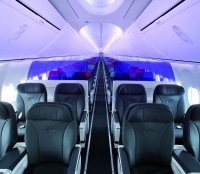 Sales of its new Business Class have been launched by Virgin Australia. Flights with the new product officially begin on 18 January 2012. Various versions will be introduced to match the airline’s fleet of Airbus A330; Boeing 737 NG series and Embraer aircraft. The new product will offer luxury leather seating with 38” seat pitch on the Boeing 737 and 62” seat pitch on the Airbus A330 Premium Australian wines and beers, and spirit selection. With all aircraft types hot meals created by renowned Chef Luke Mangan are available for breakfast, lunch and dinner. Virgin Australia has also confirmed that economy class guests travelling will also receive complimentary tea; coffee and water from 18 January on all domestic flights. Those travelling between Adelaide, Brisbane, Canberra, Melbourne, Perth and Sydney Monday to Friday will be offered complimentary beer and wine between 4:00pm and 7:00pm (which according the AERBT’s Australian representative “is a recipe for disaster”. There is still room for improvement (Paris hosted a very well organised opening day via a City Cruises Thames voyage to the show from Waterloo, only to be defeated by petty bureaucracy at Excel itself. It took 30 minutes to actually open the walkway from the boat!) 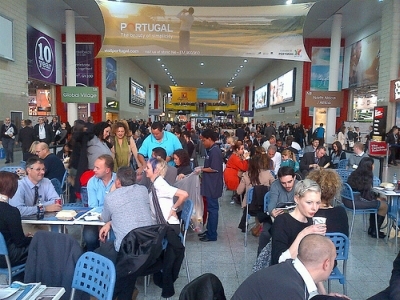 but 2011 is likely to go down as the best World Travel Market (WTM) yet. Whilst the full attendance figures are not out yet there was a tremendous buzz about the place the whole week. There were 183 new exhibitors. What is not obvious to the casual visitor is the events programme. On the first day visitor invitations were up by a massive 14%. At any one time there can be up to eight well-attended presentations going on at various venues dotted around the 100,000sq m of Excel. Plus press conferences. Exhibitors competed within the halls with networking parties and also at the many hotels that have sprung up within a few minutes walk of both the east and west entrances. The DLR, now with extended trains, just about took the strain, and if you know your way around the system, it is reasonably civilised. 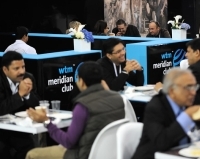 WTM is not a business travel show, although a number of major carriers once again were exhibiting. These included United Airlines without Continental for the very first time. 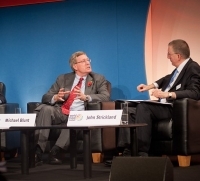 During the opening day news filtered out (via AERBT amongst others) that Business Travel Market (BTM), the dedicated June gathering at the same venue, had joined the WTM stable, universally accepted as a good move. UK Air Passenger Duty (APD) affects the travel trade severely, as does emissions trading. Martin Craigs, who took over as PATA (Pacific Asia Travel Association) – vital for incoming business – accused the UK and European Union of “hypocrisy” and denounced the UK Government’s recent appointment of MP Justine Greening as Transport Secretary. 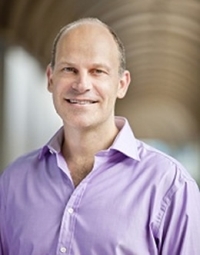 His view was simple “Moving Greening to the Department for Transport is like asking [Real Madrid Football Club Manager] Jose Mourinho to referee the game.” Greening has led opposition in Parliament to expanding Heathrow and was previously Economic Secretary to the Treasury where she was responsible for APD. World Responsible Tourism was the theme of the show this year. The World Travel and Tourism Council (WTTC) downgraded its previous forecasts for the sector by about one third, predicting growth of 3.2% in the value of travel this year and 3.3% next year. The WTTC had previously forecast growth of 4.5% for this year and 5.1% for 2012. The United States has its first-ever unified international consumer promotion. An initiative of Brand USA Inc – formerly the Corporation for Travel Promotion – the new identity represents the first phase of a promotional campaign aimed at increasing visitor numbers to the country by 40% to 300m by 2020. Whilst in last week's AERBT we reported that the European Tour Operators Association (ETOA) was very negative regarding the London 2012 Olympics, they will have no significant impact on UK travellers’ holiday plans next summer according to the World Travel Market Industry Report 2011 which was released during the show. More than 1,000 holidaymakers who had taken at least one seven-days-or-more holiday during the past year were asked about the effect of 2012 Olympics would have on their holiday choices. Only 8% of the UK population have Olympics fever and plan to incorporate the Games into their 2012 summer holiday. While 6% plan to leave the UK to avoid the Olympics. Half said they would holiday abroad as usual, with 36% holidaying in the UK but not visiting the Olympics as part of their holiday. Nonetheless, Brits are overwhelmingly positive about the UK’s hosting of the Games. 60% agreed that tourists will be encouraged to visit London with more than half recognising the marketing opportunity for London (56%) and the rest of the UK (47%). With many Olympic events, from sailing to soccer, taking place outside London, more than one-third (34%) also agreed the Games will drive visitors to other parts of the UK. 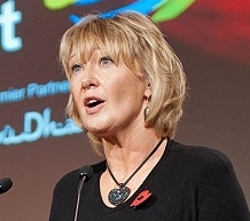 Fiona Jeffery said: “The British travelling public believes that the Olympics will be good for London and regional tourism, without necessarily wanting to attend themselves. ExCeL London, home of World Travel Market, is also hosting a number of events at London 2012, with the boxing, fencing, judo, taekwondo, table tennis, weightlifting and wrestling competitions taking place under its roof. Pan Am flies again. It seems that after easyJet and Come Fly With Me, BBC viewers are now in for a well-received ABC series that (supposedly) shows the lives of a group of Pan Am pilots and air hostesses as they take to the skies. It’s a “Soap in the Sky” already proving addictive viewing on the other side of the Atlantic. It takes off Wednesday 16 November, 21:00-21:45 on BBC Two. For those who prefer something more serious go to the BBC iPlayer for Saturday 12 November 20:00. The Real Story of Pan Am. Starting 5 December 2011 and continuing throughout the winter season, Air France will serve Dubai with a flight departing daily from Paris Charles de Gaulle. The new A380 destination is made possible by the aircraft’s redeployment to Dubai from Tokyo for the winter season as a result of lower seasonal demand in Tokyo. For the 2011-12 winter season, Air France will operate six Airbus A380 aircraft from Paris Charles de Gaulle, serving five destinations: New York-JFK, Johannesburg, Montreal, Washington and Dubai. From 28 May 2012 one of Air France’s two daily services to Los Angeles will be upgraded to an A380, making it the third US destination served with the Super Jumbo. Next summer, with the arrival of two more Airbus A380s. Tokyo will again be served by a Super Jumbo. Helvetic Airways has announced it will launch a new route between Bristol and Zurich from 5 December. Flights linking the South West with the Swiss financial centre will operate three times a week. Zurich is home to the world’s fourth biggest stock exchange and is a centre for banking and insurance, pharmaceuticals, and high technology industries, as well as the world’s largest gold trading market. Zurich also has much to offer leisure travellers, with a vibrant nightlife and cultural scene coupled with a rich history centred on the medieval old town. The city’s airport also serves renowned ski resorts such as Klosters, Grindelwald and Wengen. Flights will be operated by a two-class Fokker 100. Want to sleep in an airport before connecting to another long haul flight. Dubai has introduced state-of-the-art modular sleeping pods designed to offer travellers comfort, privacy, entertainment and connectivity. Called SnoozeCube, each of the accommodation units contains a full-sized bed, a touch-screen television offering a selection of entertainment and music, as well as high-speed internet access. Most importantly, the units are connected to the airport’s flight information system to ensure that passengers do not miss their flights. As many as 10 of the sound-proofed units have been installed adjacent to Gate 122 at Dubai International’s Terminal 1. The last Bendy Bus blocking London’s streets is expected to be off the roads by the end of the year. With Mayoral elections due in 2012 it will be interesting to see if Ken Livingstone, who introduced the unpopular vehicles, will put a return in his manifesto. 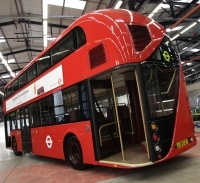 Current Mayor Boris Johnson has unveiled its replacement, the first bus designed specifically for London in more than 50 years, built by Wrightbus factory in Ballymena, Northern Ireland. In just under two years the bus has gone from the drawing board to a fully functioning prototype. Critical design features include three entrances and a double staircase to deliver the speediest possible boarding for passengers; and an open platform at the rear, in common with the iconic Routemaster. But will it be named after that most popular of buses? The UK’s National Air Traffic System (NATS) and Civil Aviation Authority (CAA) have set new flight efficiency targets designed to deliver 600,000 tonnes of CO2 and £120m of fuel savings over the next three years. This is the equivalent of around 3,000 flights between London and New York. The scheme is based on several years of development work by NATS responding to requests from its airline customers. It will establish Europe’s most comprehensive and developed incentive regime to encourage the most environmentally efficient use of airspace. One of London’s largest hotels, the 4-star 785-room Strand Palace at the Aldwych end of the famous street has completed a major refurbishment of its conference and events facilities. Now available are 11 newly designed state-of-the-art rooms that can be used for business meetings, dinners, conferences and exhibitions. The multi-purpose spaces are well-equipped with the latest technology, including touch panel lighting controls, air-conditioning, high speed wi-fi and advanced audio-visual equipment. Further specialist equipment can be sourced by the in-house conference and events team. Nine of the rooms are situated on the lower ground floor, which is accessed through a private entrance at the front of the hotel. This leads to a grand Art Deco staircase which creates an impressive sense of arrival. In the heart of the meetings area is a spacious foyer which, with its informal atmosphere, provides a great space for networking and relaxation. Virgin Atlantic has introduced a brand new offering in its Economy Class cabin with a fresh new take on aircraft dining. With Virgin all drinks are complimentary, highlighted by The Welcome Cocktail – “A refreshing mix of fruit juices with or without vodka, served in a fabulous new purple glass with a stylish, quirky, new swizzle stick that makes the drink uniquely Virgin Atlantic. Economy passengers will now receive a brand new menu and their meal on a new soft touch, non-slip meal tray. Introduced is bespoke crockery and unique, ergonomically designed cutlery. On shorter flights a cold breakfast or quintessentially British afternoon tea will now be served in a deli-style box adorned with the words ‘High Tea’ or ‘Good Morning’ in the widely spoken languages on board including German, French, Spanish, Hindu, Mandarin, Arabic and, of course English. Dessert comes separately and are larger, served with a choice of tea, coffee or now a comforting mug of hot chocolate on night flights. The cup features the word ‘Slurp’ on its side in the seven most spoken languages on board. . Earlier this year I parked alongside a Lancia Delta in sunny Spanish climes and remarked to my wife that I would be testing an example when we got home but it would be wearing a Chrysler badge as a result of the Fiat-Chrysler tie-up. Depending on differing national markets, this already established 5-door medium sized hatch back will either be badged as a Lancia or a Chrysler. In the UK it is the familiar American name and in addition to the winged Chrysler badge there are some cosmetic changes that, in my opinion, subdue the Italian character to a degree. Notably the frontal styling reminds me of the iconic Chrysler PT Cruiser and initially I was a bit non-plussed about the trans-continental merging of two body styles though I found that the overall looks grew on me once I had viewed the car as an individual product rather than trying to do a positive dissection of the two characteristics, it is simply better to treat this car as a new product as will be the general case of other offerings resulting in this marriage of the marques. I would suggest that the Delta is an alternative to a Volkswagen Golf, Ford Focus and Peugeot 308 though it is clearly a more individualistic product that I suggest steers clear of the mainstream competition by offering sleeky looks allied to a generous size, competitive general performance allied to easy driving rather than a sporting touch of a traditional Lancia. Chrysler has clearly gained by the development of the Delta as it has had access to Fiat’s advanced technology in the form of the Multiair (petrol) and Multijet (diesel) compact power units. Thus there is a choice of four engines ranging in output from 118 to 162 bhp, a regular 6-speed manual gearbox plus a robotised 6-speed manual on the mid-power 120 bhp petrol unit. A conventional automatic is not offered. The emphasis has obviously been on providing a well packaged product based on four specifications – S, SE, SR and Limited rather than muddying the waters with long lists of options. I have concentrated this first encounter with this Italianate/American on what is expected to be the bigger selling SE version powered by the 1.4-litre Multiair turbo petrol engine which is a lively performer without the excessive power surges that was common with earlier turbo petrol units. It delivers an impressive 138 bhp with smoothness, flexibility and passable noise levels to provide good mid-speed pick-up, acceleration to 60 mph from rest in just under 10 seconds and a claimed, top speed of 126 mph achieved in fifth and 6 sixth gears. Fuel consumption, considering the body size/engine capacity is commendable, expect and above 40 mpg figure with sage employment of the Stop+Start system though this can drop somewhat if you push too hard while an emissions figure of 132 g/km is above average. At the wheel it is a relaxed situation, the gearbox was just starting to loosen up on the low mileage test car though it was indicative of an easy change action and a good spread of ratios, the brakes are smooth and progressive with good pedal feel, the Dualdrive electric power steering system is light and responsive though the strong return action takes time to accept. The comfort aspect is that of a roomy 5-seater with a few reservations. For example the driving position is fairly good despite not having reach adjustment of the steering wheel and shallow cushions, and the sliding rear seats allow for longer limbed occupants though the rakish rear roofline might prove a bit of a pain in the neck. Without doubt the interior presentation gets close to that of a small luxury product, a smart and well stocked and soft touch finished fascia (though can suffer from irritating glare under certain conditions), privacy glass, leather finished steering wheel, remote/keyless entry, quality media/audio systems, electric release for the reasonably proportioned luggage area and the powered panoramic sunroof. Other plus factors included powered/heated/folding door mirrors, dusk till dawn lights, extensive use of LED lighting, a refrigerated front oddments compartment (for chilled drinks or medications?) and a comprehensive trip computer system. 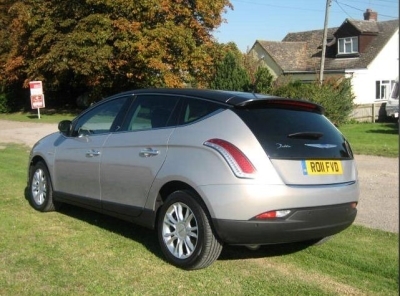 Alloy wheels but no spare, six airbags and a top 5-star NCAP (safety rating, a choice of good quality trim and fittings, fairly well made but not bench-mark class – that’s the Chrysler Delta, a logical Euro-sized offering that should attract a very varied customer profile. A product that looks forward rather than backward. Rivals include: Ford Focus, Peugeot 308, Skoda Octavia, Citroen C4, VW Golf. These are tumultuous times in the world of air travel, at least in the UK. AERBT thought it might be worthwhile to review the situation and bring readers up to date. Three items top the bill. Firstly, APD is being reviewed with an announcement during the Autumn Budget on Tuesday 29 November. The Treasury is being lobbied remorselessly by airlines, the travel industry and the world of commerce. Secondly, a Government review is being carried out with the first tentative steps announced in March. This will probably include an indication of Downing Street’s view on the future regarding the South East airports. And thirdly, Lufthansa has indicated that British Airways is the preferred buyer of bmi, an airline that at one time it coveted but when forced to purchase was reluctant by all accounts. There is a moral to this story. Lord Glendonbrook (Michael Bishop) must be laughing all the way to the bank. All three topics come under the aegis of the new Secretary of State for Transport (and now Cabinet Minister) Justine Greening, although APD is a past interest (or is it?) from her time at the Treasury. They are also intertwined. APD tops the bill. Whether it is the Pacific Area Travel Association (PATA) (see this issue WTM), Governments in the Caribbean, or industry bodies in the UK, all agree that APD is a pure income. It always has been except that previous Chancellors liked to keep up the pretence of an environmental tax. Sharp-eyed followers of Westminster will note that suddenly the Government is agreeing it is just a revenue generator. Why? The legal people have realised that Europe is also charging on an environmental basis from January. Even Whitehall has not the effrontery to arraign twice for the same reason. If you have to tax why not on a straight mileage basis. It makes more sense. Next up is the Government review of aviation. The problem here is that it covers a vast field with all manner of interests putting forward their views. Just taking the case of where a new runway should go opens a can of worms. The spring offering is likely to be just words, with little action. Let us hope we are wrong. The integration of bmi into BA will be a complex operation with the pension obligations, wage differentiations and crew seniority problems to overcome. In airline terms bmi is not large, employing 3,600 staff and a fleet of 27 (mainly) Airbus A320 series aircraft. On its head to head routes into Heathrow there will be initially no competition, although other carriers, those who can get the slots, might wish to invest at some point in the future. By all accounts Virgin is suffering now that long haul Glasgow clients need to fly on BA into Heathrow. Predators might be hovering to divert passengers through other hubs. As for British Airways and Lufthansa, one presumes that bmi Regional is being sold off separately which leaves bmi Baby, rattling its own pram. Virgin Atlantic has highlighted its objection and the takeover might well include some sort of slot trading in order to pacify Sir Richard Branson. He is now talking of joining an Alliance. The Star Alliance obligations will need unravelling and likewise integration into oneworld. bmi is also a shareholder in NATS. British Airways will still not have as much dominance as Lufthansa, Air France and KLM have at their respective airports. On the surface one of the biggest losers is BAA. Yes, it will have to find new tenants for the bmi hangar complex, but more importantly T2 is still very much in the planning/construction stage. Better now to reconfigure than when the nice new bmi lounge is in place ready for occupancy. Who moves in the airport version of musical chairs BAA will have to decide. With bmi, BA now has the slots to plan for at least the next five years. And with plenty of new aircraft on the way too. Over to you Minister. Plenty to sort out. 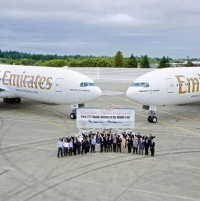 Coinciding with the opening of the Dubai Air Show Boeing and Emirates (Sunday) have announced the largest aircraft order in the history of the Seattle company. With a value said to be US$18bn Emirates have signed up for 50 Boeing 777-300ERs (Extended Range) plus options for an additional 20 of the best selling twin-aisle commercial jetliner. GE is the engine supplier. Emirates is the world's largest 777 operator with a fleet of 94 777s through direct purchase and lease, plus additional unfilled orders on backlog for 41 777-300ERs. It is also the only airline in the world to operate every model in the Boeing 777 family, including the 777 Freighter. Emirates took delivery of its first Boeing 777 – a 777-200 in 1996, and since then, the airline has deployed the 777 on short, medium and long haul routes. As AERBT went to press details were not available of what the operating fleet size might be but Emirates says that the order is nothing to do with Airbus A350 delays. A further A380 commitment is rumoured for later in the week. Wizz Air, the Hungarian based low-fare airline, said to be the largest of its kind in Central and Eastern Europe, has come up with an interesting vehicle hire innovation. Instead of tying itself to one operator, which seems to be the norm for budget carriers, it is co-operating with Dublin-based CarTrawler which offers broad choice of renting, but just not with one company. 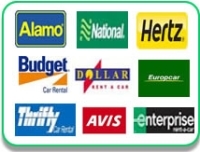 CarTrawler is not dedicated to a single operator but has a selection of car rental options from over 550 leading and independent car rental suppliers in 171 countries in 30,000 city and airport locations. The site is offered in 30 languages and multiple currencies. In the case of Wizz Air customers can go to the airline web site and look for car hire at the actual destination they are flying to. What is then seen on line is not a single rental operator but a whole series of alternatives with different rates and car options. Seventeen highflying graduates from across six European countries have joined easyJet’s European Graduate Programme. Members of the programme spend the first two years fully involved in the business, with graduate opportunities in Operations, Finance, Engineering, IT, Customer, Network, Revenue and Sales, Marketing and HR. The programme puts graduates in control of their own career path as they learn from leading industry people and are exposed to business critical projects. Each graduate on the programme is assigned a dedicated mentor to provide them with business and career advice and support to build a strong network within the organisation. With the new Berlin airport due to open in June 2012 (and Tegel’s closure) Lufthansa will at the same time boost its UK services to the German capital Berlin with new daily services from Manchester and Birmingham. These are due to start on 3 June and will be operated by Airbus 320 series aircraft in a two-class configuration. Singapore Airlines (SIA) has formally launched its new medium and long haul low-cost division, selecting the name Scoot for the operation. Due to make its maiden flight in mid-2012, it will initially operate four ex-SIA Boeing 777-200s. On offer will be a two-class, no frills service with fares aimed at 40% less than legacy carriers. The fact that it exists at all demonstrates the effect that the low-cost airlines is having on SIA. “We chose the name ‘Scoot’ for many reasons, not least because it‘s different. Rather than the tried and tired ‘airlines’ this, ‘airways’ that or ‘air’ yawn, it’s short, sharp and snappy. It stands out. It’s geographically independent, and can be a verb or a noun,” said Campbell Wilson, Chief Executive Officer, Scoot. Mr Wilson (40) has been with SIA 15 years. Whilst the legal and technical integration of United and Continental airlines has still to be completed, from a public perception point of view the Houston-based (Continental) is fast disappearing, WTM (see below) typifying the situation. In the meantime the airline is expanding its intentional services with daily flights between Houston and Lagos introduced this week (Wednesday16 November). United will start the new year in a very positive mood going double daily on New York/Newark to Frankfurt on 2 January. The airline will add new daily non-stop flights between New York/Newark and Buenos Aires, in April 2012, followed by Washington to Manchester in May and Dublin in June. On a more mundane level the airline has announced that it has selected Panasonic to provide wi-fi connectivity on more than 300 United Airlines mainline aircraft beginning in mid-2012. Panasonic’s Ku-band satellite technology will provide connectivity on flights worldwide. 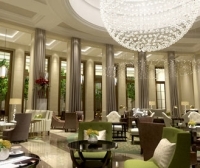 Corinthia Hotel’s London flagship hotel in Whitehall Place, is now up and running and setting new standards in an area very short of 5-star accommodation. 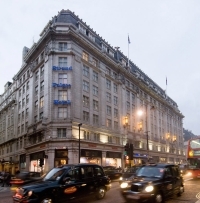 The property first opened in 1885, within very easy walking distance of Downing Street and the centre of Government. The London Evening Standard (which we like, and not just as it praises AERBT – as does The Daily Telegraph) has reported on an airline whose cabin crew were in such a hurry to get off they left a passenger asleep on board. He was found by the aircraft cleaners. AERBT diplomatically is not mentioning the carrier concerned as it does at least employ ground staff to tidy up the aircraft on turn-around, unlike some operators, no names mentioned again, who have done away with that cost, and leave it to the flight crew.